The month of July not only brings us the end of Harry, it brings us to the end of an era. 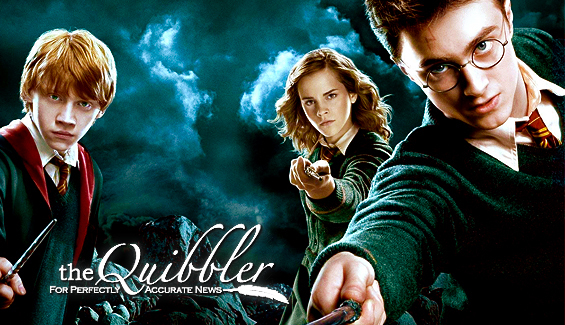 With the publication of Harry Potter and the Deathly Hallows, the era of the Harry Potter craze will unofficially come to an end. And with it, The Quibbler will change up it's format to reflect the downturn of HP love. TQ will no longer be published in monthly installments, but will retain a quarterly format, publishing four times a year, until the premiere of the final HP movie, Deathly Hallows, somewhere around 2009/2010. Though we're sad to leave our monthly discussions behind, the staff at TQ recognizes that the publication of the final book will strip us of our ability to theorize, speculate, and chat about what Harry's fate might be. Since this makes up half of our issues, it only makes sense that we shift to something that can report the news of the final two films while still making the issues fun and entertaining for our readers. Monthly issues might stretch HP news a bit too thin, whereas quarterly issues will let us share news and features while keeping our content fresh. We hope all of TQ's loyal readership will come back and visit with us four times a year. Though we'll miss our monthly camaraderie, we're happy we've been able to share our HP fandom with you. As always, TQ forums will be open through the duration of our publication for simple discussion. So if ever you feel the need to shout about the ending of book 7, or squeal over how great Daniel looks for Half-Blood Prince, come on over and join us! Thank you for four great years, and we'll see you in September with our first quarterly issue--which will include our reviews of OOTP, Deathly Hallows, and more TQ fun!